Britain's Prince Harry and first lady Michelle Obama helped kick off the Invictus Games for wounded veterans with uplifting speeches Sunday night, joining other figures from the worlds of sports, entertainment and politics in a glittery opening ceremony. The two-hour event in Orlando, Florida, included performances by British singer James Blunt and soprano Laura Wright. Actor Morgan Freeman and former president George W. Bush — honorary chairman of this year's games — sat in the audience for the ceremonial start of the games at Disney's ESPN Wide World of Sports Champion Stadium. Nearly 500 athletes from 14 different countries are competing in the Paralympic-style sports competition over a four-day period beginning Monday. The Invictus Games are the creation of Prince Harry, who got the inspiration to help wounded and sick military personnel and their families after his two tours of duty in Afghanistan. 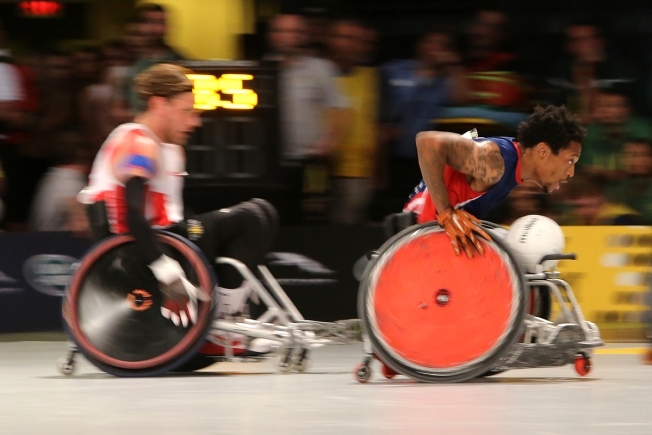 The initial Invictus Games were held last year in London. "I can't tell you how proud I am to have the second Invictus Games open in America," Prince Harry said. "I'm a long way from London tonight, but when I look out, I see so many familiar faces, servicemen and women, their friends and their families and all of the people who got them here. I feel like I'm at home." The evening began with participants dressed in their nation's colors marching into Champion Stadium to a standing ovation from the crowd. There were several musical performances and then three veterans spoke about the injuries they suffered and their fight to regain control of their lives. "I served along soldiers from all over the world," Prince Harry said. "I saw the sacrifices you and your families made to serve your nations. I learned about the importance of team work and camaraderie in the way that only military service can teach you." There was a military flyover and the black and yellow "I Am" flag, which has become the symbol of the Invictus Games, was flown by helicopter into the stadium. There was also a fireworks show. The first lady spoke toward the end of the ceremony. "It is truly an honor to be here tonight to help kick off this year's Invictus Games," she said. "I want to, of course, start by thanking Prince Harry for his outstanding leadership and for bringing the Invictus Games here to Orlando. He is truly our Prince Charming. He should be proud of his work."